Inside the entrance to St. James Presbyterian Church at Big Bras d’Or on Boularderie Island in Cape Breton there is a tarnished bronze tablet, ignored by almost everyone who passes by on a Sunday morning. The old tablet bears the names of those in the church’s congregation who served in the First World War. Of the eleven Livingstones listed on the bronze plaque five made what we have come to call ‘the ultimate duty to King and Empire and would never return to Nova Scotia. They lie in British war cemeteries scattered across Flanders and northern France. the then called Dalhousie Law School, class of 1903. Visit the fourth floor hallway of Dalhousie’s Weldon Law Building and you will see a framed photo montage of the 1903 class and faculty, including the dean for whom the building is named: Richard Chapman Weldon. After graduation Charles Livingstone returned to Cape Breton to practice law at Sydney. But not for long. Like so many of his Livingstone kinsmen he was drawn by the lure of distant places. In 1908 Livingstone went west, settling in Yorkton, Saskatchewan. At that time Saskatchewan had been a province of Canada barely three years. Charles went to work with a fellow practitioner on Yorkton’s main street. He flourished. In short order he was Yorkton’s mayor. In the Canadian general election of 1911 he ran for Parliament. That was the year the Conservatives under Robert Borden finally defeated the Laurier Liberals. But not in Saskatchewan’s Mackenzie district: there Livingstone was trounced by the incumbent Liberal. By 1914 Livingstone was 43, a successful middle-aged lawyer. Given his age and community standing he might easily have left the fighting to the young men of Yorkton. Instead he enlisted in the 1st Canadian Mounted Rifles and went off to war. While training in England, Lt. Livingstone dutifully corresponded with friends and family. His war relics include a packet of postcards to a young nephew in Cape Breton that reached their destination, damaged and water-stained, after the ship carrying mail to Canada was sunk by a German U-boat. By October of 1916 Livingstone, twice promoted, was in the thick of fighting near Courcelette village during the Battle of the Somme. The result of the enemy’s fierce October 12 artillery barrage was a battalion casualty toll of 48 soldiers killed, wounded or missing. Six of these casualties were mortal, including Maj. Charles Livingstone. He died in the arms of a friend and fellow officer from Yorkton who recorded Livingstone’s final words: Well, I’m done. I’ve done the best I can for ‘B’ Company. Write to Father. The regard his fellow citizens felt for Charles Livingstone can be felt even today in Yorkton, nearly a century after he died. Livingstone Street is named in his honour. In the city’s courthouse another bronze tablet honours his memory. 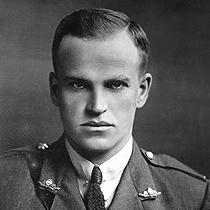 Charles’ younger brother David was 26 when war broke out in 1914, and a student at the Dalhousie Law School. He quit his studies in 1915 to enlist in the 185th Battalion, the Cape Breton Highlanders. David’s in-uniform portrait suggests a serious young man trying to look the part of a menacing soldier. Like his brother Charles he wrote to family back in Cape Breton. His war relics include a book sent to his sister at Christmas and inscribed to her in his fine handwriting. The handwriting and the usefulness of his legal training is displayed in another relic of his war: a soldier’s will prepared by David. The soldier, his witness and Lt. David Livingstone would all die before the war was over. In mid-October 1918 he was in the thick of the fighting for the city of Cambrai. On October 10, just a month to go before the Armistice, he was commanding a motor machine gun unit when, once again, enemy shellfire found its target. The Livingstone family of Black Brook at Boularderie had lost another son. David was said to be his father’s favourite. He had endured the loss of Charles and a third son, Hugh, but David’s death was too much to bear. Within just a few days of receiving the dreadful news from Cambrai the family patriarch was dead himself. The cause, the family believed, was a broken heart. These Dalhousie men, Charles and David, are only two of the myriad sacrificed in the ‘War to End All Wars’. They lie in military cemeteries at Pozieres and Haynecourt in northern France, cemeteries as beautiful and haunting as the hundreds of others scattered along the Western Front. The effect of these cemeteries and the unfathomable grief they convey is well captured in a new documentary film, ‘Fallen Soldiers’ by Clerisy Entertainment. The film debuted Remembrance Day 2012 on Eastlink Television. Eastlink re-broadcasts it from time to time. Among the Nova Scotia soldiers whose stories it tells are Charles and David Livingstone. Dalhousie University made every effort to record the names of those who served, those who were decorated and those who lost their lives during the First World War. The President’s Report estimated that 525 Dalhousians were involved in the war only some of which saw action. The following is a list of law students and alumni who had enlisted. The names can be found in the President’s Report.